What started out as a trip to Armenia in 2005 has turned into a burgeoning enterprise for Ed Baykar Dervishian. 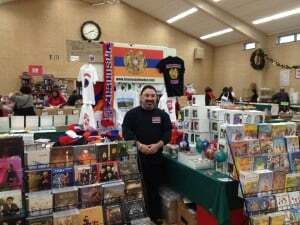 Together with his Armenia-born wife Narine, the two have nurtured a business called “The Armenian Vendor,” which travels the circuit at bazaars and conventions peddling anything and everything under the native sun. It’s America’s answer to the Vernissage—the open-air market you’ll find in Yerevan—with merchandise that stretches the gamut from CDs and DVDs to food, T-shirts, games, and promotional items. On a recent visit to Sts. Vartanantz Church in Providence, I stumbled across a recording of Armen Tigranian’s opera “David Beg,” which I hadn’t heard since my childhood days, and—get this—a scented candle with red, blue, and orange wax. My shopping was far from complete, and I added an Armenian flag to replace one that’s seen better days, a T-shirt featuring a manual typewriter (nostalgic), and lastly some gift cards from Zadig Orphanage, a place after my own heart. I had visited that orphanage and was so enamored by the children there and the artwork they portrayed that I wound up sharing my experience with the Armenian press. On any given day, you’ll find the Dervishians tending to business with three children in tow: Anna, 7, Tanya, 5, and Natalya, 12 months. No, they’re not for sale. It all adds up to a dedicated, hard-working Armenian family, steeped in the roots of their ancestry and taking every initiative to promote it. It’s about a guy who graduated from Lehigh as an engineering major with a minor in music who saw a need for Armenian commodities and decided to address it. Behind every successful man stands his woman, and Baykar is no exception. Without his wife, he admits, there’s no way this venture could have prospered. Narine worked 15 years in finance and puts the experience to work here, juggling her day job with three kids, this business, and housekeeping chores. They’ve recruited the help of many friends in bringing the products back from Haiastan and getting them sold at various events. Sponsors also get a slice of the pie, so everyone benefits. Besides music and videos, Armenians are hot after T-shirts and unusual items created by artisans throughout the world. Though by no means a Karsh, Dervishian’s photos of Armenia are another good sell. The stories behind the images are free and entertaining. Children’s toys, books, and educational items are always up for grabs, especially during Christmas. So he could better help his fellow Armenians, Baykar joined the Knights of Vartan. He’s also been a parish council member at the Armenian Church of the Holy Translators in Framingham and helped start the Armenian school there. What might surprise you about Baykar is his musicianship. He studied violin in his younger days and went places with his instrument. He was in regional and all-state orchestras in New Jersey along with many pit orchestras for plays and ensembles. Much of that has taken a back seat due to time constraints. People who know him recognize the stories he’s waiting to tell, even if it might interfere with business a tad. He’s a genuine resource for Armenian products, information, and events. There’s the one about a bike-a-thon in New York City a few months ago. A priest called to order 40 shirts from his inventory to outfit the bikers, just two days before the event! Baykar hooked up with Talene Khachadurian, president of the New York Armenian Network, for help. They found a participating biker and got together along a highway to transfer the shirts and get them into the proper hands just in time. The future is today, not tomorrow, for the Dervishians. Depending on time, energy, and finances, Baykar would love to raise the business from a local “mom and pop” operation to one with satellite divisions selling live across America. The next time you may cross paths with this vendor, drop by and say “Hye.” It just might make your introduction that much more special. few local Armenian bazaars, and set up tables with our jewelry and pictures of Armenia. Armenia is the best way to experience all that the country and its people have to offer. realities of modern day Armenia and diasporan Armenian art in a single accessible location. traditions and culture that he had only heard and read about growing up in the United States.